The title of this post has a double meaning. 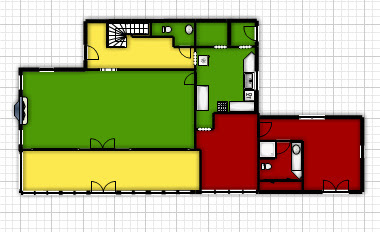 Today I'm going to show you our first floor floor plan and share with you our plans for the first floor! 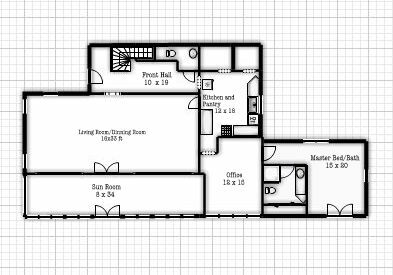 So far we've shown you snippets of the house plans like the kitchen which shows how the kitchen was set up when we bought the house. We've also shown you a ton of projects around the house, both big and small, like our mason jar chandelier, moving the half bath and creating a pantry in its spot. Despite what we have shown you, we have yet to show you the layout of our house so today you finally get to see the first floor floor plan. To oriente you a little, The front door to our house is right in front of the stairs. The driveway runs along the wall of the front hall, half bath and pantry. The road is parallel to wall of the sun room and living room and the "backyard" (which from the street looks like a side yard) is along the wall of the sun room, office and master. The garage is detached and sits off the top right corner of the master. We've spent a lot of time in certain areas of the first floor and have basically done nothing in other areas (and haven't even shared pictures of the room!). The green rooms are the rooms that you've see a lot of and we have been focusing most of our attention. The yellow rooms you have seen a little bit and we've spent a little bit of time working in and the red rooms you haven't really seen at all because we've done nothing with them. Nate and I have a general plan for the projects we want to do on the first floor and what order we need to do them in, but for our sanity, here is an organized list of things that we've done and plan to do. Be warned; this is going to be a long list. Possibly make into master closet and bath? OK. That is our very extensive list. It's always nice to have a lot of things crossed off the list, but we have a long way to go. We are not focusing our attention on the office and master bed/bath for now since that will be a major overhaul we'll have to tackle all at once. Until we do that, we will continue to slowly cross off things from the rest of the list! PS you can click on the crossed off items to see them!